Our indoor and outdoor venues are at Meridian Field, Turners Hill Road near Worth. The site entrance is directly opposite World of Water and then follow the cinder track around the first field. Click here for a map and further details. 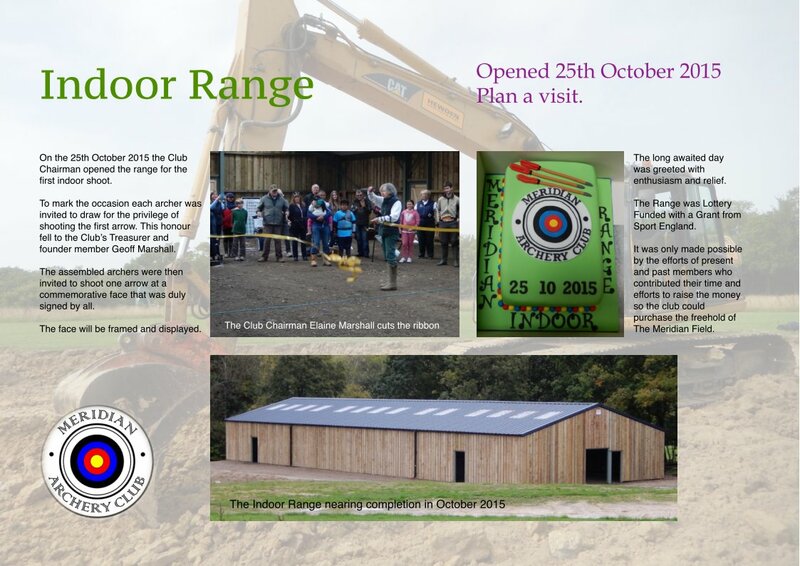 Our new Indoor range was opened for the first shoot on 25th October 2015. Please click here for photos of the range and the opening ceremony. The Indoor season runs from September to April but the range may also be used during the summer months during inclement weather or if you want to work on technique or equipment changes/tuning at short range. The range can be hired out to other clubs and community groups. For further details email the Chairman on Chairman@. Email address should be completed with "MeridianArcheryClub.org.uk". The outdoor season starts on January 1st and ends on December 31st each year, with no limits, other than the weather, on when we shoot. On a Sunday we have assembly at 09:45 and commence shooting at 10:00. On other days we tend to start a little later. The Summer 2019 is available to view/print.